If you manage to get your hands on some super fresh fish, this is the perfect recipe to try. I used Barramundi fillets, but snapper or any other white-fleshed fish would work as well. It’s a really quick dish to prepare. The flavours are also very simple. But if the fish is really fresh, it will taste incredible. I used this recipe with a few minor changes. Place fish on a rimmed plate that will fit inside your steamer. Add all ingredients in (a) except pak choi. Steam fish for about 6 minutes. Remove steamer lid, add pak choi over the fish. Cover and continue steaming for another 2 minutes. Once the fish is white, it’s cooked. 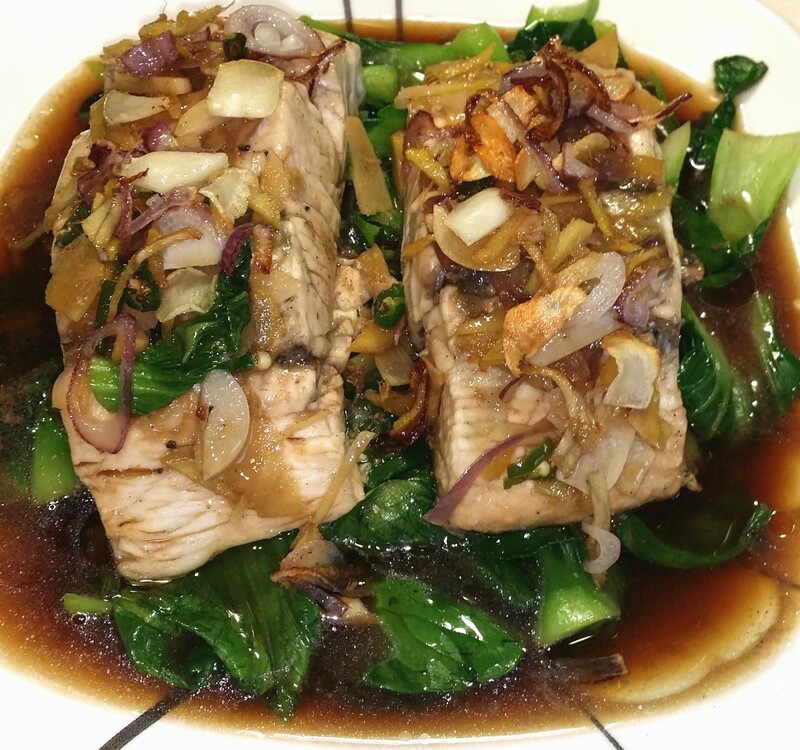 Arrange cooked pak choi on a plate, place fish over the pak choi. Pour over any of the sauces left behind from the steaming. In a small pot, add oil. Once hot add all the topping ingredients (except coriander) and fry till crisp. Pour the hot oil and topping ingredients over the fish. Sprinkle chopped coriander on top. Serve with rice. Enjoy!